This entry was posted in Promotions on May 14, 2017 by GrillTechs.com. FREE i-Grill Mini with Purchase of any Full-Size TEC Infrared Gas Grill. **Shipped to customer when Grill is registered. 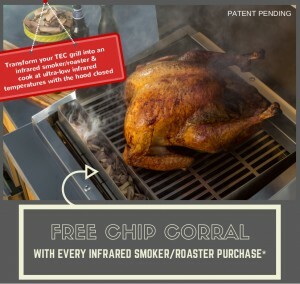 FREE Chip Corral shipped with purchase of any Patio FR Smoker/Roaster accessory. This entry was posted in Promotions on May 18, 2016 by GrillTechs.com. 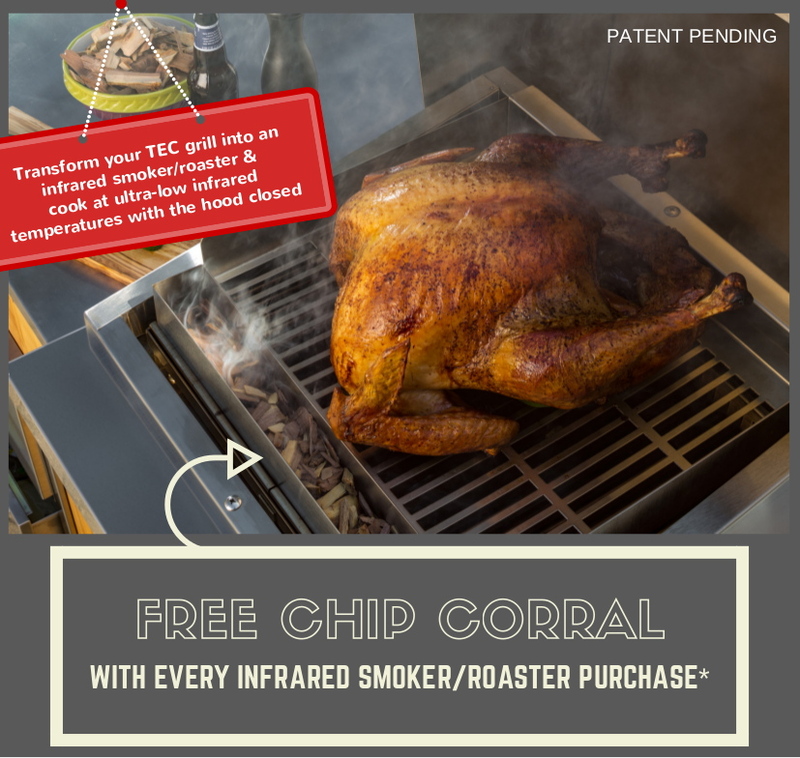 DON'T MISS THESE GREAT TEC INFRARED GAS GRILL PROMOTIONS THIS HOLIDAY SEASON! This entry was posted in Promotions on November 29, 2015 by GrillTechs.com. How to determine which Gas Valve your TEC Grill has. Before purchasing a new Burner or Pilot Gas Valve for your TEC Patio II, Sterling II or Sterling III please reference the following. If your grill was manufactured after 06/01/1998 it will have gas valves that are bolted in to the gas manifold. Sometime the serial number is not legible so you will need to locate the valves to determine if they do or do not bolt in to the gas manifold. 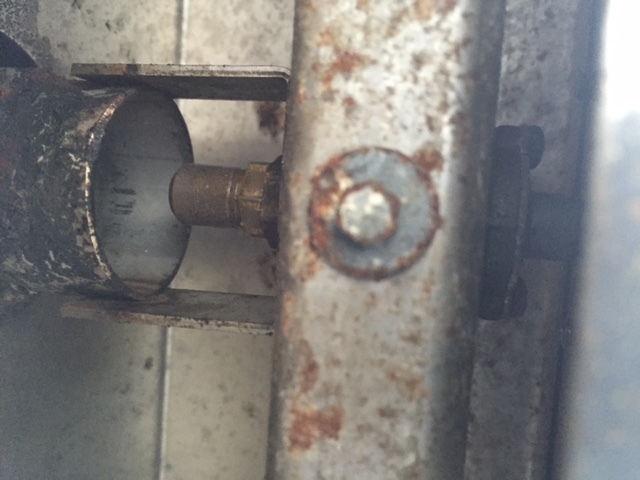 If the valves bolt in to the gas manifold you'll see a bolt head located on the bottom side of the gas manifold directly beneath each gas valve. Follow photo shows a bolt head on the bottom of the gas manifold looking up into the space where the pull out drip pan was. 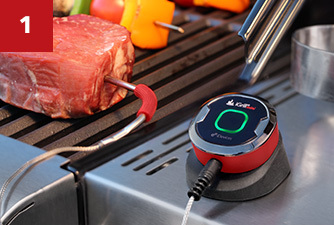 This entry was posted in TEC Tech Tips on July 19, 2015 by GrillTechs.com. 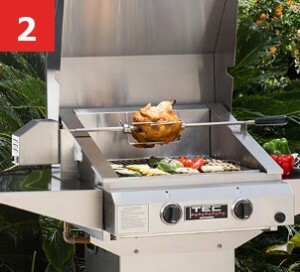 This entry was posted in Promotions on June 12, 2015 by GrillTechs.com. We get asked a great deal what is the difference in food grilled on the New TEC Technology vs. the TEC's Old Ceramic Technology. We have decided to put some different foods to the test! We are going to start by showing you some basic foods grilled by just about everyone on a regular basis. Foods you tend to pull out of the fridge after a crazy day at the office, running late getting home and need to throw something on the TEC Grill really quick. Both grills have been preheated. We throw one burger on the G-Sport and another burger on the Sterling II and let both cook for exactly 3 minutes per side on High fire, with both lids "OPEN"
The burgers are now medium well... perfect internal temperature of 150 degrees. Time for the test. What is the difference in char? What is the difference in the score-marks? And what is the end result of weight of the burgers once grilled to medium well? Which burger is the G-Sport and which burger is the Sterling II? I know those long time TEC users out there with the Old Ceramic technology can tell the difference! The Sterling II burger (LEFT) had more visual char, the score-marks are close to 1/2" wide and the weight dropped from from 5 oz to 4 oz. 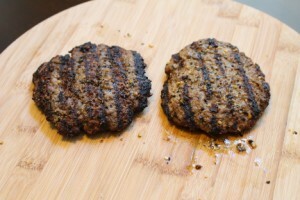 The G-Sport burger (RIGHT) had very little char, the score-marks are close to 1/8" wide and the weight dropped from 5 oz. to 4 oz. So which burger do you prefer? This entry was posted in The TEC Difference on April 30, 2015 by GrillTechs.com. 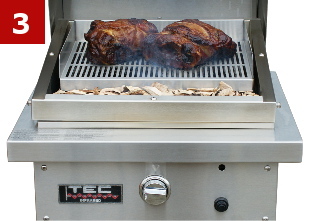 TEC manufactures the only grill that cooks with 100% infrared energy. Totally eliminating the hot air associated with grilling. So food retains more of it's own natural essence and comes off the grill with unparalleled juiciness and a distinctive charbroiled flavor. You can literally taste the difference. The radiant glass panels below the cooking grates are the secret to TEC's juicy charbroiled flavor. They block rising hot air from the burners, so it never reaches the food to dry it out or ignite food drippings. So you'll rarely have a flare-up on a TEC grill. No flare-ups = no charred food. How low can you go? 200 degrees - 250 degrees on a TEC. The patented infrared grilling system offers the highest AND lowest grilling temperatures of any infrared grill available. TEC's authentic charbroiled flavor. The radiant glass panel below the grates incinerate food drippings, infusing food with a distinctive outdoor grilled flavor. Pour on the sauce! Burners are protected from food drippings, so pour marinades and beer directly on food while cooking. They'll sizzle and steam on the glass and flavor food. Even temperature across the grate. 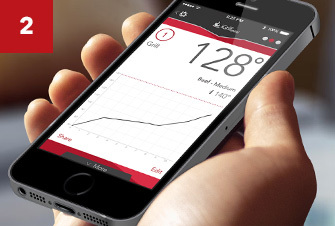 The burners are specially designed to distribute heat evenly across the cooking surface --- no hot spots or cold spots. This entry was posted in The TEC Difference on April 9, 2015 by GrillTechs.com. 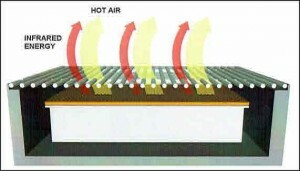 Infrared grills sold by other companies use TEC's old ceramic infrared burners that cook with 35% infrared energy and 65% hot air. Hot air dries out food as it cooks, which causes it to become tough and even shrink. It also causes food drippings to ignite, creating flare-ups that char food. 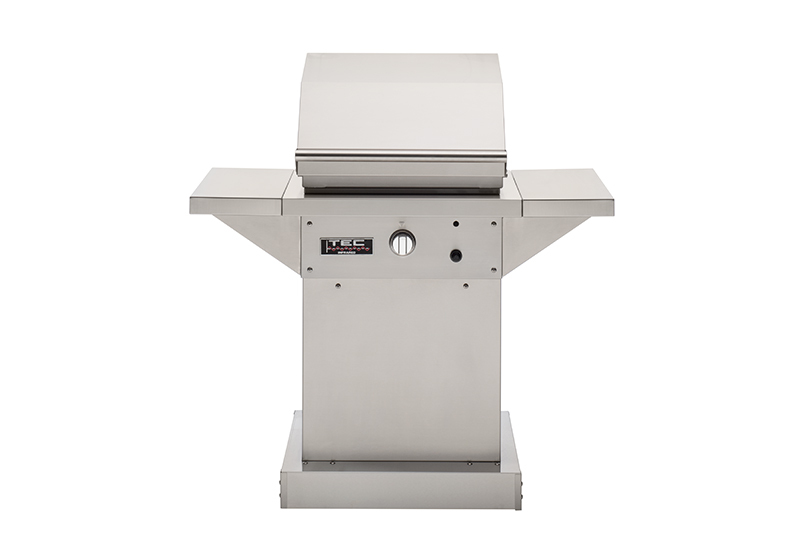 These grills do not heat the cooking grates evenly, and although they cook hot and fast, they cannot turn down to the lower temperatures needed to cook delicate foods or to smoke or barbeque low and slow. Traditional gas grills cook with 100% hot air, which robs food of its own natural juices.Food begins to dry out and becomes tough. It even shrinks. 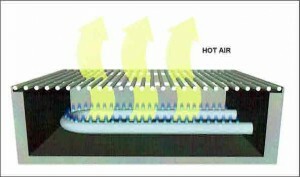 The convective burners in these grills cannot reach the searing temperatures of infrared grills. They heat up and cook much slower. They also heat the grates unevenly, producing hot and cold spots across the cooking surface. So you have to know where the sweet spots are to cook with any consistency and frequent flare-ups cause charring of food.